Steve Treviño performs special 'Til Death. Courtesy, Shore Fire Media. 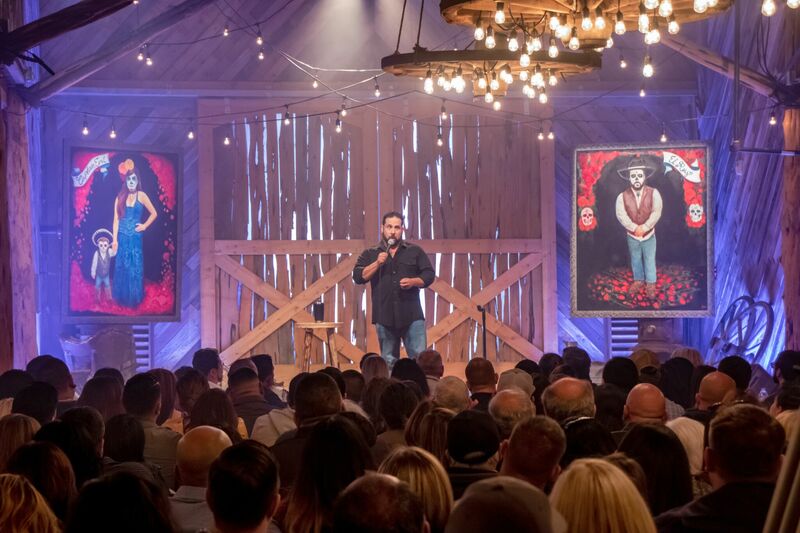 Steve Treviño recently took the time to share with OCN about his journey in comedy, breaking into the mainstream with Relatable on Netflix, and his new special, 'Til Death, a Comedy Dynamics production coming out on January 22. 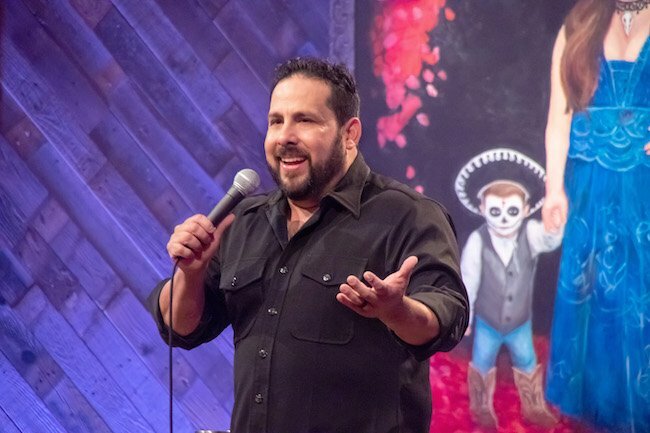 Ever since his 2012 comedy special Grandpa Joe's Son, Steve Treviño has been steadily making waves in the comedy industry. Steve Treviño first became a household name after his popular 2014 Netflix special, Relatable -- particularly on social media. Now, he continues the laughs with his soon-to-be-released special, 'Til Death, a real and hilarious look inside the joys and not-so-joyous moments of his marriage and family life. One thing is for sure -- this is something for both singles and married couples alike. The special is pure gold from start to finish. 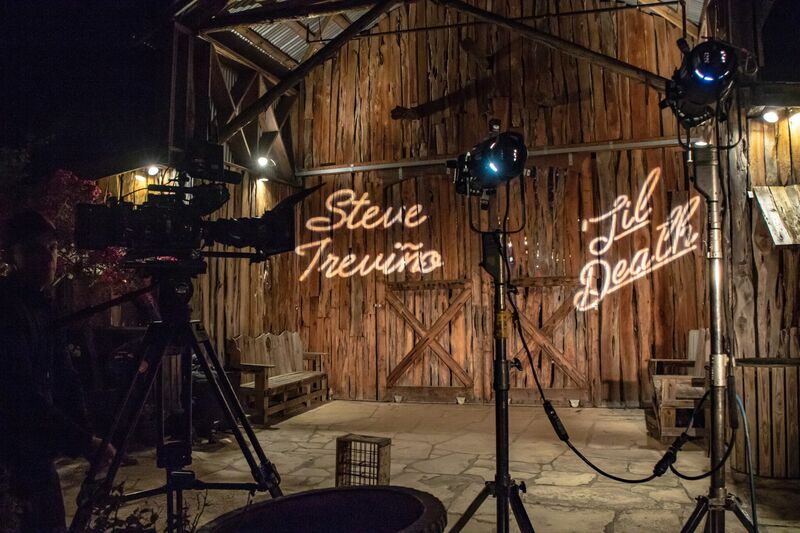 Treviño teamed up with Comedy Dynamics, one of the most well-known comedy powerhouse production companies today, to create 'Til Death, which was directed by Brian Volk Weiss, CEO of Comedy Dynamics, and Treviño's wife, Renae Treviño. Here's what Treviño had to say about 'Til Death and his journey in comedy. OUR COMMUNITY NOW: I laughed so hard at 'Til Death; it was just incredible. It made me feel lighter than I've felt in a long time. I also made laughing noises I've never made before and hope I never make again. What are your overall thoughts on this project now that it's ready for release? STEVE TREVIÑO: Thanks. I’m glad to hear that! I’m really proud of this special and I’m ready to get it out there for everyone to see. It’s the evolution of my comedy. My first special, Grandpa Joe’s Son, was mostly about my life growing up and who I became. My second special, Relatable, was mostly about my relationship with my wife and our life together. And now ‘Til Death is about trying to stay married and becoming a parent. OCN: What set this apart from your previous projects? Did you have any specific goals in mind when you teamed up with Comedy Dynamics for this one? TREVIÑO: I got sick of going on auditions and being asked to put on an accent, or even being told that I didn’t look Mexican enough. I’m proud to be American, a Texan, and I’m proud of my culture and I wanted to show what the modern day Mexican American is really like. And we’re NOT the stereotype perpetuated in Hollywood. The intro is images of my family with a song by my friend country artist Randy Rogers, and mariachis play at the end. I go on that stage and tell real stories about my family, and they’re relatable and funny to all ages and races. OCN: As a single guy, I found myself dying laughing at your family-centric jokes -- or as you say, your documentary -- because, and I know you're well aware of this, but sometimes we single people can get carried away by lofty, romanticized ideas of what marriage should look like. Were you hoping to kind of bring people back to earth and show the funny and real side of things? TREVIÑO: Yeah, I just try to bring a real-life perspective to not only married people, but people who are single, too. In this special I talk about almost getting a divorce, which is a very serious subject; but I make it funny because it's a real honest part of marriage and life. OCN: It was clear from the get-go that the crowd was with you one hundred percent. How did the energy in the room feel when you were filming? TREVIÑO: It was a great crowd because they were actually fans. In case you didn’t know, we paid to produce this special ourselves. In a way, we crowdfunded it. The audience wasn’t paid or free like some specials. They bought tickets, and we used that to cover some of the cost of production. We filmed in a barn in San Antonio. Funny thing was, It was April in Texas, so we paid to have air conditioning installed in the barn because we thought with all the people and camera equipment it was gonna be way too hot. But, turned out the weather dropped 40 degrees in one day, and we were all freezing our a**** off. No one anticipated a last-minute, crazy change in weather like that, and the fans that came out were troupers and had a great time anyway. When you watch the special, you just see everyone having a genuine, good time. Speaks to the power of laughter, I guess. OCN: Your wife appeared on stage with you at the end, and it was clear she had been laughing throughout the show. Does that feel like a big win? That was just really cool to see. TREVIÑO: I know I get on stage and rip on my wife, but the special is called ‘Til Death because, at the root of it all, it’s real love. That woman saved my life. It’s a team effort, and she was instrumental in making this special happen. This special feels like a big win for both of us. OCN: I noticed she was in the credits along with Brian Volk-Weiss as a co-director. How cool! What was that experience like? TREVIÑO: It’s not always easy working with your wife, but I really trust that she knows my vision and what I wanted to accomplish. She offers the female perspective and sees the details I sometimes don’t. She graduated from NYU; she’s a talented performer in her own right, so she understands it from that perspective, too. And we are both really passionate about how Mexican Americans are portrayed in the media and breaking the stereotype, so we share a common mission to carry that through all our projects. OCN: Comedy Dynamics CEO, Brian Volk-Weiss, is such a cool guy. I had the chance to speak with him over the summer, and he's got such a cool, humble attitude. He really appreciates the people he works with. How has your overall experience been working with him and his company? TREVIÑO: It’s been a really seamless, easy process. Everyone at Comedy Dynamics really jumped on board and embraced my vision. From filming in a barn to the idea of having Dia de Los Muertos paintings of my family on the stage. They really took the idea I had for this special in my head and made it something really cool visually. And Brian’s support throughout the project was awesome. He came up to me after we filmed the first set and said, “Wow, that was amazing!” in a fan kind of way -- not in a Hollywood, b******* kind of way, but in a sincere, real kind of way. OCN: Reflecting back on your career, how does it feel having come up through the comedy ranks and now being on Netflix and being considered one of the greatest comedians of our time? Can you share a little bit about your journey and how it’s been getting to where you are today? TREVIÑO: Haha. I’m flattered you think I’m one of the greatest comedians of our time. Thank you. Most people don’t know I’ve really had to fight for the opportunity to make each of my specials. My first one, Grandpa Joe’s Son, I had to convince the producer to do it. I told him I would send a car to get him to one of my live shows in Ontario. If, after my set, he didn’t think it was good, I’d never bug him again. He had a full lineup of specials he was already filming, so he squeezed me in between and said we’d see if Showtime bites -- and they did. Once I had that one under my belt, I thought for sure Hollywood would call and my next special would come easier. But nothing. My wife and I just decided we were gonna do it ourselves and put up our own money. I was able to get my hometown city of Corpus Christi to rally behind the project and the arena to come on board. Even as I was selling tickets for the filming, production companies kept falling through. But we just kept moving forward with the plans. After the filming, we had $400 in our bank account, and we didn’t know who was going to buy it. Thankfully, Fuse bought it, and then Netflix picked it up after that. Relatable rated high when it debuted, but even then, it got kind of got buried on Netflix. It wasn’t until I got the idea to split it up into short clips for social media that it really took off. It was the fans who made it go viral; and for that, I’m grateful. We thought for sure after that, Hollywood would call offering TV roles, or a sitcom, or even another special. I mean I had huge social media numbers now. But it just wasn’t happening. So again, I knew I had this material that I wanted to share. I knew it would make a solid special, but I had to convince a production company to get on board. Even when a network wouldn’t get on board, Comedy Dynamics came through, and I’m so proud of what we created. My point is -- it hasn’t been an easy road. But I’m determined to keep putting out a product I’m proud of -- something that’s relatable to everyone. So that’s what we’re gonna keep doing regardless of Hollywood. Because of my long journey, it’s made me funnier and better. OCN: Besides 'Til Death, what else do you have going on? TREVIÑO: I’m out on the road doing stand-up. Me and a microphone. You can check out my upcoming cities on SteveTrevino.com. **All images courtesy of Shore Fire Media. Be sure to stay up on all the latest from Steve Treviño! To preorder 'Til Death from Comedy Dynamics, you can use Treviño's link here. Are you a fan of Steve's? Share this interview with other comedy lovers, and check out his Netflix special on January 22! Since Netflix has upped their game, they've also upped their prices -- but not by much. Read more here!